The pancreas is a long, slender gland, between 12 to 20 centimeters in length that is situated in the upper part of the abdomen and is attached to the wall of the abdominal cavity. Shaped like a fish, the pancreas has five parts: head, uncinate process (a prolongation of the head), a short neck, body, and tail. The head of the pancreas (approximately aligned with the spinal cord), is surrounded by the upper portion of the small intestine, called the duodenum; the body is located behind the stomach; and the tail is located at the left upper portion of the abdomen below the rib cage touching the spleen. The pancreas is a complex organ that has two major functions: the exocrine functions of the pancreas relate to its production of enzymes while the endocrine functions relate to its production of hormones. Pancreatitis is defined as inflammation of the pancreas. There are two main categories of pancreatitis, namely acute and chronic. Acute pancreatitis is characterized by painful episodic inflammation that may, in some patients, lead to damage or destruction of pancreatic tissue, a condition called chronic pancreatitis. Chronic pancreatitis (CP) is an inflammatory condition affecting the pancreas and involves progressive, irreversible damage to the pancreatic tissue. The primary and most common symptom associated with chronic pancreatitis is severe pain (experienced by at least up to 75% of patients), either episodic or continuous, which significantly impacts quality of life. The pain may actually abate as the condition worsens and the pancreas ceases to function. If you or a loved one has been diagnosed with chronic pancreatitis, it's critical to learn everything you possibly can about this condition so that you can make informed decisions about your treatment. That's why we created the Medifocus Guidebook on Chronic Pancreatitis, a comprehensive 181 page patient Guidebook that contains vital information about chronic pancreatitis that you won't find anywhere in a single source. The underlying causes of chronic pancreatitis. The risk factors that increase a person's chances for developing chronic pancreatitis. The secondary complications that can develop as a consequence of chronic pancreatitis. The relationship between chronic pancreatitis and the development of pancreatic cancer. The signs and symptoms of chronic pancreatitis. How chronic pancreatitis is diagnosed based on factors such as signs/symptoms, patient history, physical examination, and imaging studies. Alleviating pain associated with the condition. Treating the underlying cause of chronic pancreatitis, in cases where the cause can be identified. Improving the patient's nutritional status. Managing complications associated with chronic pancreatitis. Enabling patient's to lead a reasonably good quality of life. The medications that may be prescribed for pain management in patients with chronic pancreatitis. The treatment optinons that are available for patients who no longer respond to pain medications and continue to experience severe, chronic pain. The role of extracorporeal shock wave lithotripsy in the treatment of obstructive pancreatitis caused by calcified stones that block the opening of the main pancreatic duct. The risks, benefits, and complications of the different surgical treatments for chronic pancreatitis. The role of oral pancreatic enzyme supplmentation and dietary modification in improving digestive tract function in people with chronic pancreatitis. The prognosis (outlook) for people with chronic pancreatitis and the important factors that have a significant impact in predicting the overall chances of recovery. Quality of life issues that often confront people with chronic pancreatitis and how to minimize their impact and cope better with these issues. Important questions to ask your doctor about chronic pancreatitis. A Guide to Recent Medical Literature on Chronic Pancreatitis - This section of the Guidebook contains an extensive bibliography of over 100 references to recently published articles about Chronic Pancreatitis in authoritative, peer-reviewed medical journals with links to the absracts (summaries) of the articles. These articles represent the latest advances in the field and focus on cutting-edge research, new developments, and the lessons learned from recently published clinical trials involving patients with Chronic Pancreatitis. This is the same level of that is used by doctors who treat people with Chronic Pancreatitis to keep abreast of the latest developments and breakthroughs in this specialized field of medicine. Centers of Research for Chronic Pancreatitis - We've compiled a unique directory of doctors, hospitals, medical centers, and research institutions with special interest and, in many cases, clinical expertise in managing people with Chronic Pancreatitis. The "Centers of Research" directory is a valuable resource for quickly identifying and locating leading medical authorities and medical institutions both within the United States and other countries who are considered to be at the forefront in clinical research and treatment of Chronic Pancreatitis. You'd have to spend days - or even weeks - attempting to compile your own list of doctors and medical centers but, with the "Centers of Research" directory, the information is already right at your fingertips. All you have to do is act on the information by selecting and contacting the experts or medical institutions listed in the directory by state and country. Organizations and Support Groups for Chronic Pancreatitis - The Guidebook also includes a directory of organizations and support groups whose goal is to help people with Chronic Pancreatitis by providing access to information, resources, and services. Many of these organizations can answer your specific questions, enable you to "network" with other patients, and provide guidance in areas such as financial, social, or medical-legal issues. This valuable directory of organizations and support groups includes complete contact information, including phone numbers and E-mail addresses. 20% Discount - For a limited time, you can purchase the Medifocus Guidebook on Chronic Pancreatitis at a special 20% discount off the regular list price. Your 20% discount will automatically be applied when you go to "Checkout". Order Your Copy of the Medifocus Guidebook on Chronic Pancreatitis Today! The Medifocus Guidebook on Chronic Pancreatitis is available in the following two convenient formats: Printed and Digital. "Thank you. Thank you. Thank you. I am a 37-year old man with chronic pancreatitis. I didn't know where to start looking for information about this condition on the Internet. Medifocus gave me a great start. The explanations of my illness were very comprehensive and now I can talk better with my doctor about my treatment options." "The Medifocus Guidebook on Chronic Pancreatitis helped to give me a better understanding of the condition. More than that, my doctor is open-minded and we were better able to converse on the subject. 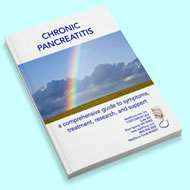 Thank you for providing this valuable information"
"I was recently diagnosed with chronic pancreatitis and this book was a lifeline to my family and me. We really did not know what my disease was or what to expect with it. Your Guidebook taught us all of that and more. Thank you so much Medifocus."